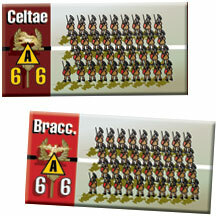 In Rome at War: Fading Legions the armies of Rome are shown in their twilight years. Although often overlooked by players who are fascinated by the legions that fought Hannibal or by the ordered, gleaming ranks that served the early emperors, they were probably the toughest of all. They certainly had the toughest job. Instead of fighting one great enemy in turn, as did early Rome which polished off in sequence the Samnites and then the Greeks before facing the Carthaginians, in the fourth and later centuries Rome’s legions faced simultaneous attacks by very powerful and widely distant enemies. Even worse, their enemies used very different forms of warfare. Late Republican Rome caught a taste of this problem when the legions of Crassus, successful at fighting barbarian infantry, failed when facing the cavalry army of Persia. To make matters even more difficult Rome was now split into two, the Western section ruled from Rome, the Eastern from Constantinople. Although the West soon collapsed, ravaged by the conflict between Christian and pagan supporters, the Roman Empire would survive for another 1,000 years. Surprisingly we know more details about the units of the Roman army of this period than in any other. A remarkable document, the “Notitia Dignitata” has survived, listing the positions of the senior officials of the Empire, including its military titles down to those of the regimental commanders. 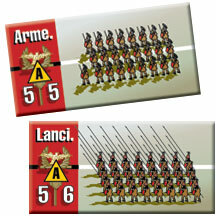 As a result we can name virtually all the units of the army. There are several other good sources. Ammianus Marcellinus is comparable to Tacitus and Polybius, and in one respect even better, since he served with the armies he described. Not surprisingly, most of the battles chosen for Fading Legions were described by him in some detail. The famous legions of the Empire still existed. However, each was now often found in several locations as emperors had often detached a cohort or two which might never return to the legionary base. An example in the game is the Parthica, which served with the army of the Emperor Julian and is probably the II Parthica originally founded much earlier by the Emperor Septimus Severus and based in Italy to keep the pesky praetorians in check. Although the game uses the title “legion” as an easy way of defining heavy infantry, there were a very large number of infantry units with different origins. Some of the long-established auxilia units were now similar to the legions but retained their old titles, such as the Celtae and Tungri. Others remained crack light infantry, an example being the Batavi that were still active three hundred years after they helped conquer Britain as shown in Queen of the Celts. Those operating with the field generals and emperors were known as “auxilia palatina” and probably given higher pay and benefits. Two units warrant special attention, the Herculani and Joviani legions raised by Diocletian and considered elite infantry. They formed part of the “praesental” armies, the troops that retained near Rome and Constantinople. By now Roman units were much more varied in weaponry and armour than before, and some show this in their titles. For example a hundred years earlier legions had added spearmen, resulting in the Lanciari, while the Bracciati probably picked up their name when given new protection for their sword-arms. One has to be careful with these assumptions; after all, the present-day British Army contains fusiliers, lancers, hussars and dragoons, all of them now fighting from tanks and armoured personnel carriers! One advantage of the Rome at War system is that its long counters compel one to form a linear battle-line, anchored by a strong infantry. Although good heavy cavalry could break weakened infantry, their main job was to challenge enemy cavalry and to drive away enemy archers. The best were the guard regiments collectively known as the scholae palatinae, about half a dozen each in the Western and Eastern Empires. Examples found in the game include the Scutarii (named after its distinctive shield) and the Stablesiani. There were light cavalry regiments, some of whose titles also dated back to the earliest years of the Empire, such as the many Moorish or Mauri units. When Rome was ruled for much of the Third Century by soldier emperors from Illyria, they raised large numbers of elite light cavalry from their region. These, such as the Octo Dalmatae (Eighth Dalmatian) were still a valued part of a field army Moors. Other cavalry were very specialised indeed such as the Dromondarii a unit of archers mounted on camels that was for a long time stationed at Palmyra. It must be emphasised again that armies of the Late Roman Empire varied greatly in size and organisation. A Western Empire army fighting the Germans relied on heavy infantry. An Eastern Empire battle against the Parthians would see the Romans field lots of heavy cavalry and foot and horse archers, with an infantry battle-line strong enough to hold if the cavalry had to fall back to rest and re-equip. They needed to be effective, for unlike in Republican Rome there were limited reserves to form a new field army if a battle was lost. The Romans lost far more men at Cannae than at Adrianople (there are two versions of this battle in Fading Legions), but the earlier Romans simply raised new legions from their huge population base. When 600 years later the emperor, his senior generals, his household cavalry and the bulk of the field army were lost, there were no reserves. The only character of the “legions” not fully shown in the game, and one that distinguished them from barbarian infantry, was their very sophisticated equipment. All heavy infantry carried a large shield and a long sword, but the front ranks were also equipped with a long spear. The ranks behind carried a range of missile weapons, the most common being darts and bows. Another deadly weapon, probably carried by the middle ranks, was the “plumbatae.” Recent research had shown that these lead-weighted darts were thrown up, so that they landed on top of the enemy engaged in fighting the front ranks of the formation! At players discretion they could allow some legions (notably those descended from the early Imperial legions, to have missile capability. For the glory of Rome! 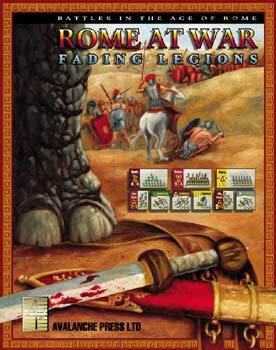 Order Rome at War: Fading Legions today.